Petey's Bing Energy is made from all-natural ingredients except for the artificial sweeteners it contains. The drink has a cherry flavor and contains dark cherry juice. 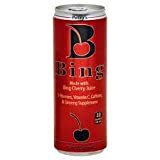 Bing Energy Drink is also available in Apple and Raspberry. 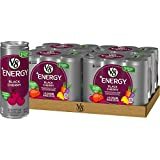 These flavors have just 100 mg of caffeine per can. Sugar content: 10 grams (per 12 ounces). 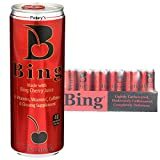 Bing Energy Drink contains 10.00 mgs of caffeine per fluid ounce (33.81mg/100 ml). Data Sources: Site at http://www.bingme.net/ Info from nutritional label, and Bing representative.